I know I was going to focus all week on holiday food - but I had to take a crafting time out. I made some really simple ornaments for the tree. I grabbed a few bags of baby mirrors, my hot glue gun, and some fishing line. All I did was cut the fishing line in small 2 inch (or 3 or 4, depending on if I paid attention or not) sections. I hot glued the fishing line to the back of one small mirror, and placed another small mirror on top. I did this another 19 times. I tried placing the mirrors around the tree to reflect the Christmas lights. No beautiful light reflections are happening on my tree. I might be the dimmest light on the tree. I just couldn't figure out where to place them for stunning reflections. Which is ok. I think it's still pretty. 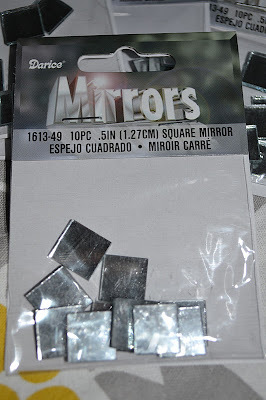 This project has made me start thinking about other projects I can do with fishing line and mirrors.